A hundred for Ed Joyce, four wickets for Alex Cusack. The two oldest men in this Ireland squad delivered when it mattered. The victory over Zimbabwe would not have happened without them. But the most encouraging thing to come out of this win for Ireland was not the form of their old-timers, but the maturity shown by one of their youngest men. In both Auckland and Hobart on Saturday, ABs entertained the crowd with their clean hitting. Unlike Abraham Benjamin at Eden Park, Andy Balbirnie at Bellerive Oval ended up on the winning side. 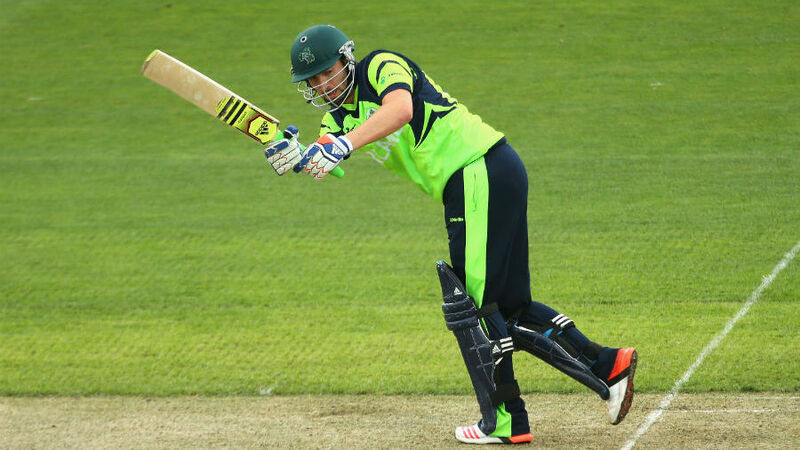 Balbirnie's only failure was in trying to make his ground in the 50th over of Ireland's innings; a maiden ODI century was missed, but Balbirnie's 97 was a thing of great beauty for Ireland. Not surprisingly, Joyce was Man of the Match for his 112, an innings of significance for Ireland's World Cup campaign. But Joyce is 36 and a veteran of two countries, a man who has been there, done that. You expect him to stand up. Balbirnie is 24, and the second-least experienced player in this XI. "You'd think he was one of the senior players," Ireland's captain, William Porterfield, said after play. Joyce and Balbirnie came together with Ireland having started steadily, but no more. The score was 79 for 2 in the 21st over. Their 138-run partnership came off 112 balls and they kept Ireland's World Cup dream firmly alive. Their win, and South Africa's loss, means that Ireland need one point from their last two games against India and Pakistan to make the quarter-finals - assuming West Indies do not slip up against UAE. If Ireland remain on six points, circumstances dictate that they cannot qualify on net run rate. "Andy took the pressure off me today," Joyce said after the match. "He hit his first ball for four and just rotated the strike really well. That gave me the ability to do the same thing. I was very lucky getting to 30 or 40 but after that it felt pretty good." Balbirnie and Paul Stirling represent the younger generation of Ireland batsmen, the players to whom the side will look in the coming decade as Joyce winds down and as the O'Briens and Porterfield move into their mid-30s. Stirling failed here, but his credentials are well established. Balbirnie has established his in this World Cup. His 58 against South Africa came in a losing cause, but was enough to give Porterfield confidence to bump Balbirnie up to No. 4 against Zimbabwe. The faith was repaid. Porterfield himself had struggled to rotate the strike early in the innings; Balbirnie did so with ease, and then stepped on in later in the innings, notably crunching 20 runs off a Tinashe Panyangara over to help Ireland to their highest ever ODI total. Balbirnie has been around for a while. He captained Ireland at the Under-19 World Cup in 2008 and his ODI debut came against Scotland in 2010. But it was not until last year that he really started to emerge from the fringes. There was an 86 against the ACT in Canberra in October, and his maiden century for Ireland, 129 against New Zealand A in Dubai in November. That innings was against a high-quality attack that boasted Adam Milne, Kyle Mills, Doug Bracewell, Matt Henry and Nathan McCullum, and if there was any doubt about Balbirnie's World Cup credentials, they were quelled. Even before that, Balbirnie had shown enough to encourage Middlesex to sign him, and he debuted for the county in T20s in 2014. It is a familiar route, the same one taken by Joyce, who played for Middlesex and ultimately for England, and Eoin Morgan, now England's ODI captain. Stirling and Balbirnie played together for Middlesex last year; Ireland must hope they do not follow the Joyce/Morgan lead and end up playing for England. They are far too valuable to their home nation. "Andy has been brilliant in the last six months he's come into the team," Joyce said. "I hadn't seen him really bat before this tournament. He got a brilliant hundred against New Zealand A in Dubai against nearly a full-strength New Zealand attack, and he was great today. He played brilliantly against South Africa." As Balbirnie moved through the 80s and 90s, a conga of Ireland fans danced on the grass bank at Bellerive Oval, celebrating what they hoped would be their country's third win of the tournament. It was, though, closer than they would have liked. Now they find themselves in a strong position, although needing to beat a third Full Member (or share points) to progress. "It's very hard to say when you come in at the start of a long tournament, what you will need or won't need," Porterfield said. "We've just try to break it down and take it each game as it comes. Whatever we need when it comes down to the last game, we need. "But we're just taking this India game now and that's all we can look forward to. We've managed to deal with the West Indies game and the UAE game and not look past them. We've got to freshen up when we arrive in Hamilton and be ready to go there." It will be a huge challenge, their bowling depth especially having been exposed through the middle overs against Zimbabwe. But at least their fate in this World Cup remains in their own hands. And not just old hands.